Nice sweater dress fit, without being all body con. Why is fit eluding us and why don't we know what good fit is? There are lots of reasons. * Most schools do not have garment sewing in their consumer classes, instead, emphasizing utilitarian sewing such as making pillowcases, putting on buttons, etc. You won't learn about fit if you don't learn to sew garments. If you are blessed with a family member or friend or neighbor who can mentor you, it is one of those special things that is passed along, like Mom's Pot Roast recipe, but most of us aren't that lucky. * Styles often dictate fit. Think of jeans. Some years they are baggy, some years skin tight, sometimes pleated, and so on. All of these changes have a distinct effect on fit. 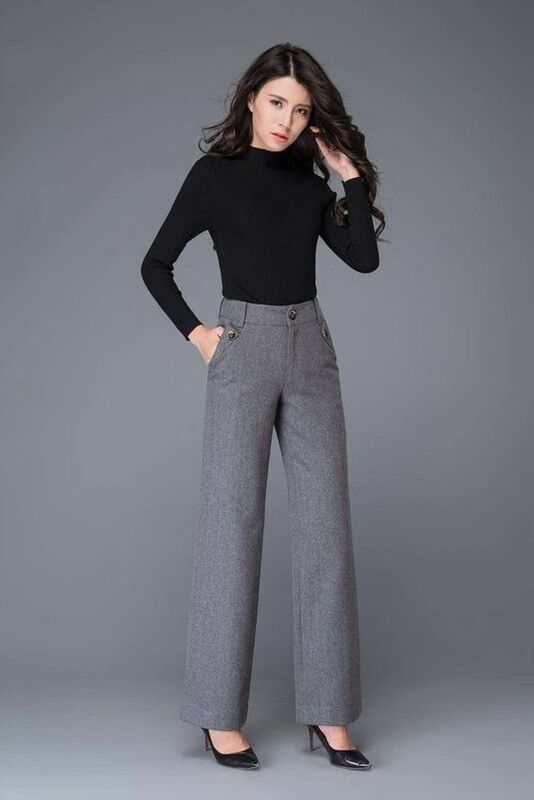 You can know how to make a perfectly fitting pair of trousers, but if the skinnies are in, what do you do now and what is the standard for that? * We wear generic sizes like Small, Med, Large and XL, 2XX. and so on. Who even knows what this is? My husband wears XL. He is not overweight or real tall. It is the same with women's clothing. There is no standardization. But what if I am a real size, one that is in between med and LG? I buy the medium and its snug. I buy the LG and it's big and sloppy. I need a size in between for a good fit and it's not there so because it's not there I think that Med and LG are what I am and I can choose to be snug or baggy. I can't choose to have a good fit and it's just not fair or right. This is done by manufacturers as limiting the sizes like this increases margin hugely, really. Read it in the NY Times! * Retail clothing manufacturers use NO, did you hear me? NO standardization of sizing. I can wear a size zero in a 600.00 Ralph Lauren trouser. (That was fun to try on and look inside.) I take a size 6 in a Gloria Vanderbilt 24.00 dollar jean. Gloria does not talk to Ralph regarding fit standards so we need to get over what we think our size number is. It doesn't matter, to them or us, so, no retail size standards exist between manufacturers. * Sewists, and this is often quite a revelation for our newer sewing friends, pattern size has ABSOLUTELY NOTHING to do with the size of clothing you wear in retail, Just get over it. Throw that concept out of the window and start fresh like you never bought a dress before and work with what the pattern is using for measurements for a start. Good fit will always elude you if you pick your retail size in the pattern size. Promise. Oh, one of my favorite "overheards"is "is this pattern true to size?" Wha? True to whose sizing, Ralph's or Gloria's? I need "sum splainin" on that one, please. * Another reason why fit is eluding us is our good faith. We take it for granted that the people who design patterns, the companies as well, know what they are doing. We assume they are using trained pattern makers or hiring out for those skills. On the other end of the spectrum are those who never worked in the garment business or went to design school and yet are designing and selling patterns, sometimes really cute ones. Do we really expect them to provide great fit? Do your research and check Pattern Review and blogs for honest reviews. Designer/company FB pages have opinions that are pretty much fangurled for these types of patterns so don't expect to find consistent, honest opinions there. Overfit? Smooth all over, but can she sit down? * Another valid reason good fit eludes us - we just don't know something doesn't fit. We are forgiven for this one. Our friends and families don't know either. We float out the door and glide by their admiring faces. They have no clue either and are so blown away by the fact that you just made this dress for the prom. So why bother? Because you have put dollars, effort and passion into making your "perfect" garment and shouldn't settle for inferiority. If you look at the garment on you in the mirror and it fits like a dream you will walk out of the house full of confidence, proud as can be, and ready to start your next sewing challenge. You will look wonderful! Your clothing will look triple the price too! You will rock the room! We need to know what good fit is as well as have a set of Standards by real professionals to explain it. My search ended with a document by the ASDP. Enter the Association of Sewing and Design Professionals! The ASDP, established in the early 80s, is a non-profit organization of design and sewing professionals who provide business training, professional development, networking opportunities and even a Master level certification program. It is for those who have sewing related businesses whether that be designing patterns, making felted mittens or dressing others in custom clothing and so much more. Here is a link to their website which explains more of who they are and why you should investigate even if you are not a business. They have been very gracious in allowing me to link to their immense knowledge base to help us all understand a bit better exactly what good fit it. This comes with authority and from the eyes of custom clothiers who have worked very hard and long to provide the public with this information. I thank them tremendously for their generosity. Please visit their site and check out their page on Facebook as well. They will be holding their annual convention in Danvers, Mass. this year and the info is there. In 2008 the group developed a document, "Standards of Quality for Custom Clothing." It is a 54 page PDF that covers everything a well made custom garment should be, from fit to clothing details to actual design. While we may not think we do custom clothing, every time we pick out a fabric in a color that enhances our own color and in a style that flatters our own unique body, we are making our own custom clothing. Doing this as a business for clients means there are expectations and standards to be met when dealing with them. We deserve at least as much for ourselves. This document is amazing and touches on every aspect of constructing a garment from visual design principles to technique. I felt like I found the Magna Carta. It is a learning tool for all sewists and may be just what you need as your sewing evolves. There is an entire section on "Quality Standards for Fit." from pages 23 to 31. This is immediately followed by a great ease chart for every single part of the body. There is a bibliography at the end of the fitting section to further help with fit issues. I suggest reading this document and keeping it handy on your phone or in a notebook by your machine, to refer to with your next fitting challenge. I would also like to thank the members of ASDP for what clearly is the huge work they put into this. It is here for all of us, newbies and expies (my new name for experienced sewists, feel free to use), a remarkable reference by professionals for all who love sewing. * Sleeves - . The sleeve cap usually extends about 1 / 2 inch (1.2 cm) from the shoulder point then drops vertically. * Armscye - The armscye is in line with the front arm crease when hands and arms are relaxed at the sides. These are just three pearls of wisdom for you and there is so much more in the PDF. I know you will appreciate its value and its source. Thanks again to the professionals at ASDP for this and allowing me to quote and to their gracious communications director, Aiese, for taking time to speak and share with me and now you. For a dropped shoulder this has no wrinkles and the armscye lines right up with the arm crease. It is not overfit and looks so perfectly comfy and flattering. I also thought I would offer some of my thoughts based on what I have seen and personally experienced as to what constitutes a well fitting garment. Style trends can have effects on this opinion as in jeans, bodycon dresses, and other styles but for most garments this is what we are shooting for. Keep in mind these are just thoughts that are in my own mind based on what I see out there as well as my own issues. Feel free to add and share your own. I am not going to repeat the basics that I have seen in the reading I have suggested for you already, just some of my own musings. * A well fitting garment skims. No where is it too tight or strained or pulling. See the lovely beige dress above. * A well fitting garment glides smoothly over the body. There is ease built in for comfort in moving. * Armscyes are not too low as in low enough to show undies and not to high as to look uncomfortable. * Pants crotches are not to low or long or too short and snugging up into the body creases whether they are trousers, jeans or leggings. * Pants back waists do not dip when seated. * Pants and skirts do not have horizontal wrinkles right below the waistline and above the hips. * Hip pockets do not hang open, particularly slanted front hip pockets. * Rear pockets are placed equally and are in proper proportion and placement to the size of the bum. * Skirt/dress/blouse hems do not ride up or hang down in the rear or front of the body. They are equal distance from the floor all around the body. * Backs of bodices do not have pools of horizontal wrinkles above the waist. * Darts end before reaching the apex of the mound of flesh they are providing shaping for. The larger the bust/hip the further back the end of the dart. Again, this was stated in every single book, vintage or new, that I pulled out. Overfit??? While smooth, the crotch looks high and uncomfortable. I'd like to add a bibliography here that is based on my own experience. I haven't read the Leighty/Rasband book yet or the latest from Kenneth King but will add them here as I know from others they are fabulous. Thank you to those who contributed thoughts on a bibliography and I will pull them all together here for us once again. What a wonderful post....I have been checking regularly to see when Part II would be posted. Thanks for getting permission from ASDP to post the PDF....I am sure it will be full of great information. I will read this post several times as there is so much to digest. And, I have read several times the 3rd edition of the Leichty title and highly recommend it for identifying the "issue" and how to fix it. I also have the first edition and the 3rd edition was well worth the expense. WOW! This is a great reference on how a well fitting garment should be! Thank you! That was the goal, Kay, particularly for our newer sewists. Thanks for adding the custom clothing document! It's wonderful to have this information at hand, especially for ease standards! Oh Bunny, I am so so pleased and grateful that you are back to blogging. Great post and many thanks for the PDF. It will be printed and kept in the sewing dungeon. The ease standards ....just what I needed!!!! Thanks so much. This is very good. There are some designers who need this information when taking photos of the modeled pattern. Makes you wonder as you're looking on the envelope "Is it supposed to be skin tight? Is that how it's drafted?" As a result, I never buy them when the envelope shows total body con fitting. I've lost 20 lbs, so am ok now about making a knit dress finally, but no way am I showing off my belly apron proudly. Nah, not gonna do that! I just have to swallow my comment when I see women of certain body types on FB wearing a super skin tight dress and everyone else is telling her she's rocking it. I mean how on earth can they sit? Of course, I'm old, LOL! Congrats on the weight loss! I think we all have a threshold of sorts when it comes to fit. I guess one thing I haven't said is that fit is very personal. You won't find me in my youth or now in a body con type garment but if one is confident in that look and rocks it, I say go for it. With my convent upbringing that type of look just is not one I am comfortable with, just a me thing. We do all like our fit differently and I respect that. I'm a skimmer. Others are body cons and even others are what I will call "Lagens" preferring a more voluminous Lagenlook type of dress. But if we take a look at that large white blouse in the first post, if this young woman had a large bosom and pulled up the front of the blouse or if she had a long, thin neck and the neckline was too wide and stressed her thin neck even more or if she had a rounded upper back, the fit would have been way off, even with the large-ness. of the garment. We need to understand that we all have our personal take on what fit is comfortable for us but we all need to know those "Standards of Fit" to pull it off well. Yes I really enjoyed this and appreciate the resources you shared. You have a wealth of sewing knowledge! Great post Bunny. I'm glad that you mentioned moving back the dart on larger cup sizes. I have started basting the dart before I sew it permanently, particularly in knits. There is so much variation in stretch the dart point can really change from the patterns placement. Sometimes I wonder if a poster actually looked in the mirror. A woman posted a photo of herself in a straight skirt with side front pockets. She loved it, saying that the pockets were flat and the fit was great. The pockets gaped, the skirt was tight and cupped her stomach which just made her look larger than she really was. I couldn't believe that she thought that the fit was 'great'. Another woman said that she never tries it on as she sews. I try on the garment, even simple garments I've made before, a number of times as I sew. I've got a 3 way mirror. You can't get good fit if you don't look in the mirror! I have all of Sandra Betzina's book and several of your your other choices as well. Agreed. One of the things that recently nudged me to finally get this in print was an indie designer whose new pattern has her modeling the design on her web page. It is extremely poorly fit, not just a little, and does nothing for her because of it. The fact is it could be a darling garment if it were fit better. It was pretty obvious she had a lack of experience and credentials I would assume were non existent. But now she designs and sells! This is not only a very interesting post, but also very apropos. Fit is the most difficult piece in my sewing experience lately, especially as aging has changed my shape and I can't wear "just anything" anymore! Not just fit, as dictated by the style of the garment, but does this fit actually flatter this figure? Excellent post that I will be referring back to. Thank you. Thank you, Bunny. This is a great post loaded with great reference information. I appreciate you taking the time to share this.